Lizzie*Kate Blog: COLD weather, HOT off the press! COLD weather, HOT off the press! It's WINTER in Kansas! . Actually, we're having a typical Kansas winter...freezing temps for a few days and then several respite days with 50-60 degree temps. Which is why...REAL Kansans don't wear coats! We just dash and dart from here to there, with maybe a sweater or hoodie, but rarely a heavy winter coat! If you don't believe me, come for a visit! We'll be shipping new designs early next week, and we just got them delivered from 2 local printers. (Nothing like calling it close!) Now we're springing into action, attaching already prepared buttons and beads (thousand of them!!) 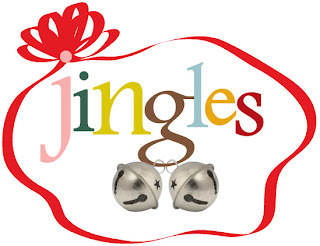 to our new JINGLES Flip-it series. amaze me with your creativity! For the first time ever, our awesome finisher is posting a FREE finishing blog with complete instructions, so you can DIY! Each JINGLES Flip-it comes with it's own embellishment pack, alternating between tiny red buttons, and aqua snowflake button with white beads. All of the designs use the same color palette...classic Christmas colors with some fun aqua, pink and chartreuse thrown in for fun! All 12 JINGLES also fit together like a puzzle to stitch a big Christmas extravaganza. 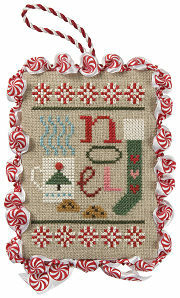 We'll supply the FREE template to combine everything, with additional stitched elements to tie everything together. Just check our website at www.lizziekate.com and click on the Jingles picture. think. Good advice...for bears and humans! Then, we'll put the Inspirations Boxers...well, in their BOXES! 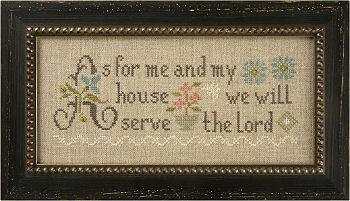 The saying on this new one is a familiar scripture from Jeremiah... As for me and my house, we will serve the Lord. The colors are muted and blend with any decor. Great for a gift (wedding, anniversary) or a special keepsake for your own home. Boxer kit includes 30 ct. natural linen, chart with bonus design (we made a cool thread ring) and embellishments. Finally, we'll send out the new Spring String Snippets. Thankfully, these don't require assembly...from us, that is. This is so skinny and fun...lots of beautiful spring colors, motifs, and pure fun! I stitched this in a couple evenings...it's so quick and cheerful! Call in the elves...it's gonna be a busy weekend! Happy Friday! I will be buying the jingles flip it's, the promise me chart pak and the spring string snippit, gonna be a lizzie Kate year of stitching for me I think! I love love love this new flip it series that you have started! I can hardly wait to get my hands...and my needle on it! Oh my! I just saw the Promise Me chart on an LNS email and had to pop over and say THANK YOU! My dd's and I (they are 21 and 22!) 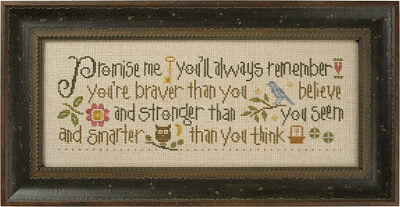 love Winnie the Pooh and this will be the PERFECT design for me to stitch for them both for Christmas!!! I love it!!! Welcome to the Lizzie*Kate blog! 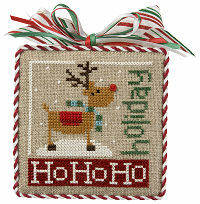 Join us as we share some "behind the scenes" stories about life, design, and of course, cross-stitch! Also feel free to check out our official L*K website here.